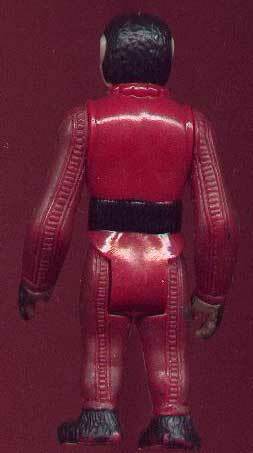 Snaggletooth is really the only vintage Star Wars figure to have undergone extensive modification after it was put into distribution. 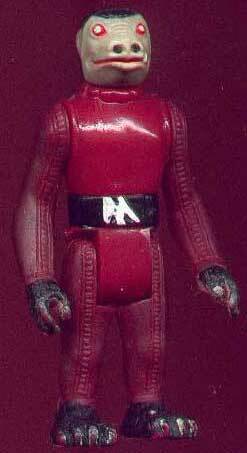 As most collectors know, the earlier version of the figure, which was tall and blue, was changed to the short red figure you see here early in 1979. Although I have seen several first shots of the blue figure, this is the only red Snaggletooth prototype I've had the pleasure of coming across. Typically, the piece lacks the date/copyright markings normally present on the back of figures' legs. But more interesting to me is the color of the hands. They have been painted black, probably because they're meant to be covered in hair. Since the head on the figure's head is black, whoever painted this thing must have felt the other body hair should be black as well. It's hard to see, but the head used here is actually from a Blue Snaggletooth which is a very light beige in color. The production head for the red Snaggletooth has a gray head.